John Kenneth Muir's Reflections on Cult Movies and Classic TV: UFO: "The Psychobombs"
An alien UFO lands in the English countryside, and takes over control of three innocent human beings, including Linda Simmonds (Deborah Grant), for a nefarious plot. In this case, the aliens plan to destroy three SHADO installations unless the organization immediately ceases all operations. Commander Straker (Ed Bishop) refuses to negotiate with the aliens and submit to their blackmail, even though he is attacked by the converted humans on the road. Soon the aliens make good on their threat. One human, Daniel Clark (David Collings) single-handedly destroys the Fairfeld Tracking Station. Next, Skydiver 3 is destroyed by one of the "psychobombs." At SHADO, Straker and the others come to understand that the humans under alien sway have been converted into living bombs. Somehow, the aliens have changed the electrical balance of the human nervous system, and made the human body "super-charged." The next living bomb, Miss Simmonds, infiltrates SHADO HQ and prepares to destroy it...but can she stopped in time? Produced in the latter half of the series run, this UFO episode-- "The Psychobombs" -- is a pretty strong addition to the canon. 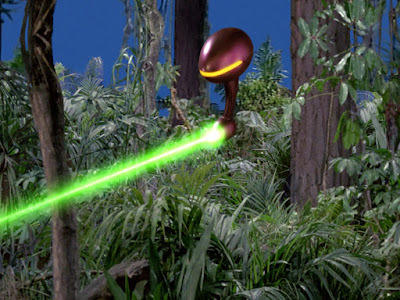 It's true that the plot-line is pure formula, involving another foiled alien attempt to destroy SHADO. The aliens hatch a unique scheme, and SHADO prevents it at the last moment. We've been here, and seen this brand of story before. However, in this case, the alien strategy of the week is actually pretty fascinating. 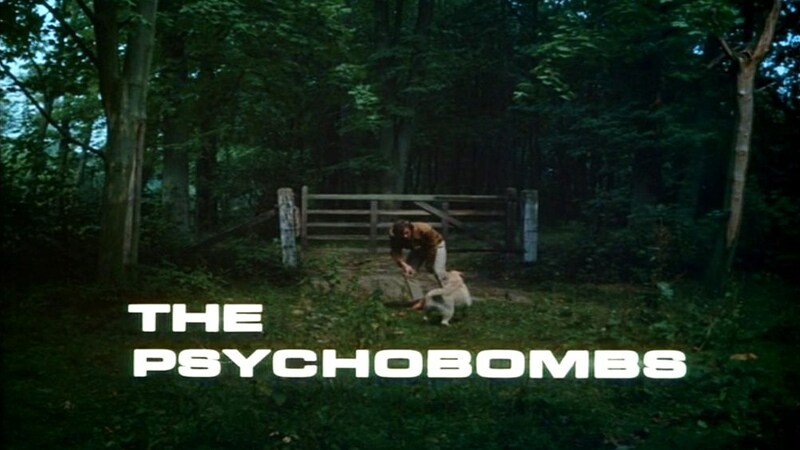 In "The Psychobombs" humans are transformed into unwitting suicide bombers by alien rewiring of their bodies and minds. In a post-911 world, this entire plot-line seems even more fascinating than it may have in the early 1970's. Indoctrination into extremist religious ideology might also be described as a "rewiring" of the human brain to serve an inimical cause. Here, the aliens get unfortunate humans to do their dirty work for them, without caring that those humans will die for the cause. The human "psycho-bombs" are physically indistinguishable from other humans, and thus orm an ad-hoc sleeper cell operating in Great Britain. They "activate" on receipt of a signal from the aliens, and as suicide bombers, destroy important installations of the enemy (us!). The problem with the story, perhaps, is that the aliens only commit partially to this very effective plan. 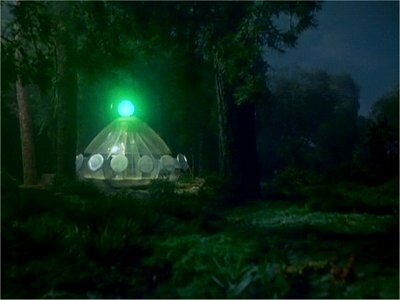 What if they landed three UFOs in Great Britain, (or two in Great Britain and one on Moonbase...), and had multiple sleeper cells active at the same time? Although the aliens fail this time, it is illogical that they don't try this subversion plan again, since, let's face it, it is 66% effective. Both a Skydiver and a tracking device are destroyed in a matter of hours! Beyond the metaphor of the suicide bomber - which works exceedingly well in today's political climate --"The Psychobombs" proves both tense and tragic. The terrorist attempt to board Skydiver 3 is dramatized with great detail and specificity, and we see security procedures fail, one after the other, to stop the psycho-bomb. David Colling's character, who dies during his bombing attempt, is revealed to be a family man, a husband and a father. Then, in the last act, Linda Simmond's fate is quite sad too. Through no fault of her own (and with no real awareness about what has occurred), Linda has been manipulated by the aliens. In the end, the young woman dies, electrocuted in SHADO HQ. It is not a fate she deserved, or earned. She was but an alien pawn. Here, again, one can see why Foster (Michael Billington) is a useful character in the series gestalt. Where Straker is quite stoic, Foster is able to express emotions in moments like these. He is moved, we can see, by the woman's unfortunate fate. Straker is moved too, we know, but has learned not to show his feelings to others at SHADO. "The Psychobombs" has stood the test of time quite well, and remains one of the more notable "alien plot" stories off this 50 year old Gerry Anderson series.